Switzerland’s business friendly regulatory environment, legendary banking system, and political stability, have allowed the nation to emerge as a preferred location for cryptocurrency and blockchain startups. With the launch of the independent, government-supported Crypto Valley Association earlier this year, Switzerland further stressed its intention to become a global leader in the blockchain and cryptocurrency space. Now with the global initial coin offering (ICO) craze that’s been undergoing since the beginning of the year, Switzerland has seen several successful ICOs taking place inside its borders. 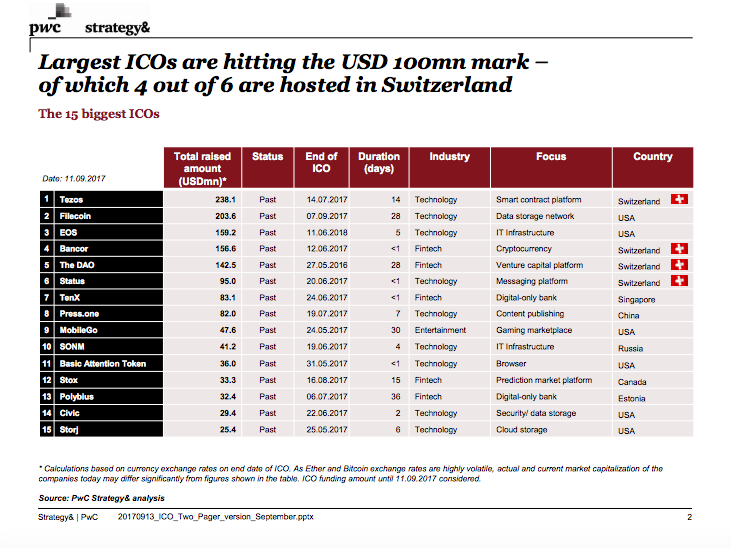 Out of the six largest ICOs, four were hosted in Switzerland, according to a PwC Strategy& report. These are Tezos, which raised over US$238 million, Bancor, with US$156 million, The DAO, US$142 million, and Status, US$95 million. An ICO is a limited period in which a company sells a predefined number of digital tokens to the public, typically in exchange for major cryptocurrencies – typically bitcoin or ether. 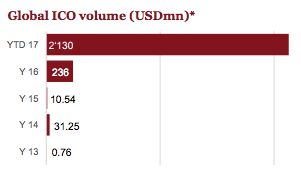 ICO activity has surged since the beginning of the year, raising over US$2 billion in 2017 so far and surpassing traditional venture capital investment in blockchain startups. But the fundraising method is still largely unregulated in most jurisdictions, and it often remains unclear whether a token represents a security, utility token or digital currency. The Swiss Financial Market Supervisory Authority (FINMA) has not yet officially announced any regulations or investor protection around ICOs, but has informally voiced support for blockchain developments and said it was looking into ICOs. FINMA currently treats an ICO depending on the functionality of the token. Furthermore, as most ICOs raise money in bitcoin and ether, high-volume transactions provide an attractive target for criminals. The ICO craze has attracted many scammers and thieves, and in July alone, two major hacks during ICOs took place: Veritaseum, which lost US$8 million, and CoinDash, which lost US$7 million. This week, FINMA closed down what it said what the provider of a fake cryptocurrency. 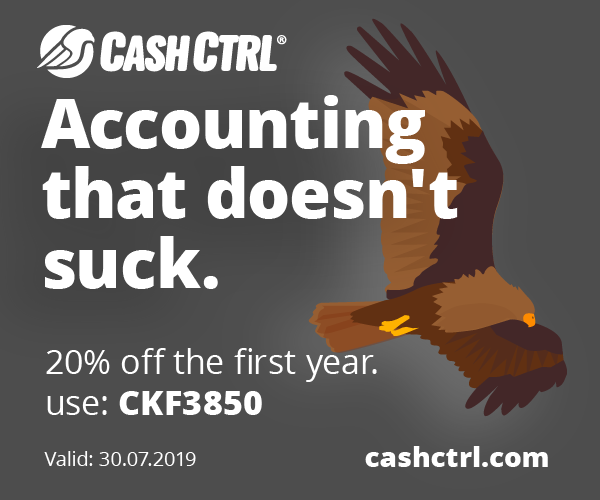 The QUID PRO QUO Association had provided so-called E-Coins for more than a year and had amassed funds of at least 4 million CHF from several hundred users. 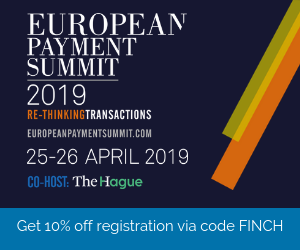 “This activity is similar to the deposit-taking business of a bank and is illegal unless the company in question holds the relevant financial market license,” FINMA wrote in a press release. In addition, the authority is conducting 11 investigations into other presumably unauthorized business models related to cryptocurrencies. The successful ICO Summit, which took place last week in Zurich and brought together more than 400 people, was a clear sign that ICOs have a future in Switzerland. The event was organized from Smart Valor, a Blockchain based company which tries to re-invent Private-Banking. Smart Valor is building a network protocol, a distributed public ledger for issuance and distribution of investment solutions. Furthermore they aim to combine the privacy and security of a leading private banking center with the accessibility and diversity of the blockchain-based open network. 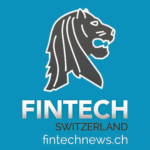 At the event, experts and industry participants representing the likes of Pantera Capital, Bitcoin Suisse, and Swisscom Blockchain, shared the inside view of recent dynamics and their vision of cryptofinance of tomorrow. A startup pitch event presented some interesting projects including Swiss Romandie based Globcoin, a startup that offers a comprehensive multi-currency digital wallet. The Globcoin account includes a Mastercard debit card, and a digital wallet that allows users transfer money and pay for goods. Globcoin lets users access six different currency wallets denominated in EUR, USD, GBP, CHF, CAD, and PLN. The service works similar then Revolut. Globcoin is currently preparing their ICO. A recent Swiss ICO Modum, a blockchain based IOT supply chain solution startup, raised 4mio CHF in only 10 minutes.